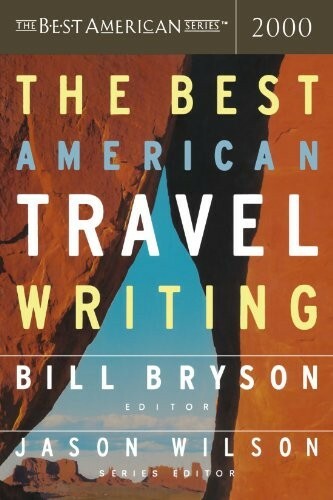 The Best American Travel Writing of 2000, edited by Bill Bryson, is the first book in the series. The other annual compilations that I’ve read impressed me so that I wanted to go back to the start and check out the stories Bryson selected. After all, he is one of my favorite travel authors. But what I found, or rather connected to the other books, disappointed me. And that’s a first for either Bryson’s books or The Best American Travel Writing series. Was there something wrong with the writing? No. Each story was fantastically told. Even the ones that didn’t particularly interest me – the locations, that is – kept me reading because the writing was so good. Stories from National Geographic, The Washington Post Magazine, Outside, TIME, The New Yorker, and more will obviously be good. You don’t get into one of those publications by not writing something of quality. So what was the problem? It’s that there aren’t enough stories about American travel in any one of the books. Certainly some are about the good ol’ U.S. of A., but not as many as I’d like. So many of the stories are from adventures in remote places, particularly Asia and Africa. I like reading about them too, but have come to desire The Best American Travel Writing be about just that – writing about travel in America and not just by American writers. Let writers and editors from Britain, France, Russia, China, or wherever else in the book so long as the story is about travel in America. And how about that? America? Should it just be the United States? What about places like Canada, Mexico, or Brazil? They’re on one of the American continents, after all, right? Without a doubt. But right now the series is by writers who are from the U.S. and not somewhere else on the continents. I certainly wouldn’t mind reading about those places either, but would much prefer to read about my home country for a change. Untold stories have to be out there, somewhere closer to home, and not just in the far reaches of continents across the globe that seem to be posted on every website and in every travel-related magazine. The reason I bring this point up with this book and not the others is because it set the precedent for the series. The others I read followed the same path as what Bryson – or maybe, more appropriately, series editor Jason Wilson – set forth in this first book. That doesn’t mean it needs to continue so. Why not deviate? Why not change it up a little? Because that wasn’t the initial purpose of the series? So what? Change can be a good thing and bring a fresh perspective to a place so many of us have seen so many times before. With that all said, The Best American Travel Writing of 2000 really is a spectacular book with a lot of great stories. Of the twenty-five pieces, I most particularly liked The Toughest Trucker in the World by Tom Clynes, Confessions of a Cheese Smuggler by David Lansing, and Winter Rules by Steve Rushin. Each one captured my interest in a different way and for a different reason, with not a one of the three, admittedly, not being about the United States. I select these three as my favorites from the book simply for their engaging writing, telling a story about something I may not otherwise be interested in – like golfing anywhere in the world, but reading about it from Greenland made it interesting. If you like good travel writing, and I’m guessing you do, you’ll like The Best American Travel Writing of 2000. But know that not a single word has the wit or humor most commonly associated with Bill Bryson. He selected the stories, but that’s about where the connection stops because each writer has their own unique and interesting voice separate from the editors. Don’t let that deter you, though – or the fact that there’s really nothing about the United States in here or the other books – because there really are a lot of interesting and engaging stories out there waiting for you.